NHL legend Ted Lindsay, who was inducted into the Hockey Hall of Fame in 1966 and was a founding member of the NHL Players' Association, died on Monday at 93. Ted Lindsay, a hard-nosed star winger known as Terrible Ted who formed Detroit's famed Production Line with Gordie Howe and Sid Abel, has died. He was 93. Lindsay's impact on hockey was felt on and off the ice. A nine-time all-star who was inducted into the Hall of Fame in 1966, Lindsay is considered one of the greatest left-wingers. His influence on the game is still felt today. Lindsay spearheaded the drive for a players' association and was its first president. The NHL Players' Association, formally ratified as a labour organization in 1967, honoured him in 2010 by renaming its MVP award the Ted Lindsay Award trophy. Lindsay normally helps hand out the trophy on NHL awards night. But he was absent last June 20 in Las Vegas when the award went to Edmonton Oilers captain Connor McDavid for the second straight year. "What he's meant for the players, what he's done for the [NHL] PA, we wouldn't be here without him. So thank you to him." Lindsay became one of the NHL's premier players while patrolling the left side with fellow Hall of Famers Howe and Abel. They were put together in 1946-47 and in 1948 dubbed The Production Line, a nod to Detroit's auto industry. For the 1949-50 season, Lindsay won the Art Ross Trophy as the league's leading scorer — with Abel second and Howe third — and won the first of his four Stanley Cups. The others came in 1952, 1954 and 1955, with Lindsay succeeding Abel as team captain for the last two. In 2010, the NHLPA renamed the Lester B. Pearson Award the Ted Lindsay Award, given to the league's best player as voted by the players. In 2017, he was named by the NHL as one of the top 100 players of all time. The five-foot-eight, 160-pound Lindsay cast a huge shadow on the ice. The native of Renfrew, Ont., was hard working, skilled and able to antagonize opponents. "I hated every guy I played against," Lindsay said in an interview for the Legends of Hockey documentary series. "And I must say that the opposition, whether it be Toronto, Montreal, New York, Boston or Chicago, they felt the same way." Lindsay, inducted into the Hockey Hall of Fame in 1966, played 17 seasons in the NHL from 1944 to 1965 with a four-year break near the end of his career. He scored 379 goals and added 472 assists in 1,068 games while collecting 1,808 penalty minutes. He is credited with starting the tradition of players skating around the ice with the Stanley Cup after winning it. Lindsay did it spontaneously after the Wings won in 1950 so fans could share in the experience. Lindsay never forgot the fans paid his salary, not the team owners. He wished some of today's athletes shared that view. Lindsay's face bore the scars of many an on-ice confrontation — he reckoned he had over 700 stitches — and it had been some years since his nose was straight. He used to tell the doctor: "Just put a couple of stitches in and I'll come in after the game and you can finish up the job. former referee Red Storey once said: "He's got one of those faces that holds about three days of rain." Lindsay never lost his edge. Even in his late 80s, he was less than impressed when he saw NHLers chat at a faceoff. But he marvelled at the size of today's players as well as their passing skills, and he remained a hockey fan, often visiting the Wings dressing room. Lindsay had an aorta valve replaced in April 2014 but soon returned to the gym to continue his workout regimen. He credited wife Joanne's cooking as another reason for his longevity. 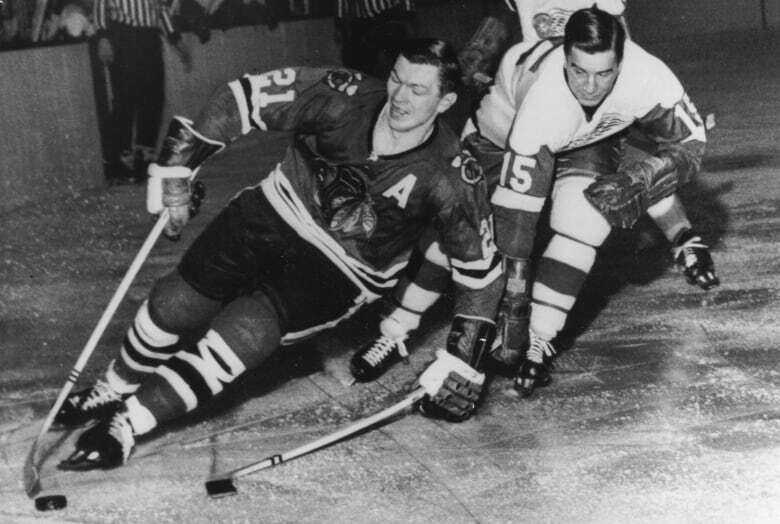 The NHL in the '50s belonged to Detroit and Montreal. The Red Wings won the Cup four times and finished first in the league seven times while the Canadiens had three first-place finishes and five Cups. "Every building that he went [to], they hated his guts," former Habs great Bernie (Boom Boom) Geoffrion told Legends of Hockey. "For his size he never backed down to nobody, nobody I can recall. He would fight anybody. … And he could put the puck in the net, and he could shoot and he could skate." "I hated that S.O.B. ... There were none any meaner," said former Toronto Maple Leaf Howie Meeker. "Never had a bad shift." Former Bruins player Milt Schmidt called Lindsay "probably was one of the most hated players in the National Hockey League. 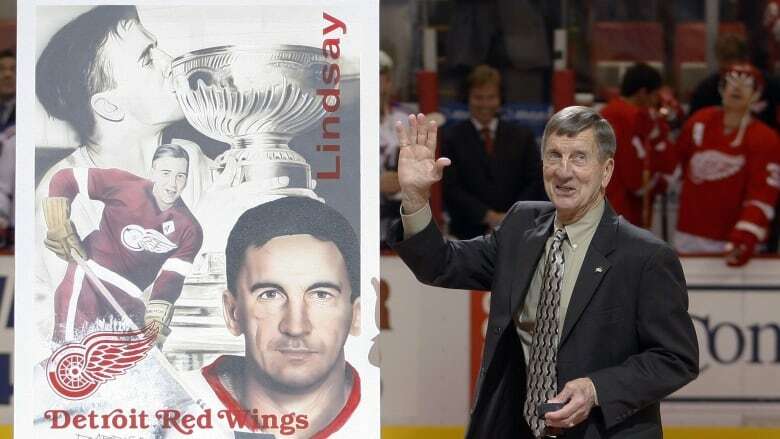 After retiring, Lindsay served as a TV commentator and analyst before becoming general manager of the Red Wings from 1977 to 1980 and interim coach in 1980-81. His return to the Red Wings was trumpeted under the slogan, "Aggressive hockey is back in town." Born July 29, 1925, Robert Blake Theodore Lindsay grew up in the gritty mining town of Kirkland Lake. The youngest of nine children, six boys and three girls, he said, "I learned how to fight young." His first pair of skates were hand-me-downs from his neighbour. They were too big but Lindsay made them work until his dad could afford to buy him a pair that fit. The Maple Leafs heard word of a talented youngster at St. Mike's, but Lindsay was injured when they came to see what the fuss was about. A player named Joe Sadler had a good game that night and the Leafs, thinking he was the one being touted, put him on their negotiation list. Lindsay, who also helped Oshawa win the Memorial Cup final against the Trail Smoke Eaters, showed his smarts off the ice by signing a two-year deal with a $2,000 bonus that guaranteed he would play at least 40 of the Wings' 50 scheduled games and not go to the minor leagues. In 1944, with many players serving overseas in the military, Detroit was rebuilding, so Lindsay got his chance to play. It was the era of the Original Six teams, with rivalries that ran deep. "I was gifted with a competitive spirit; I hated to lose," Lindsay said in 2010. "If it meant running over you, through you, spearing you, whatever it took, I was there for one reason and that was to win. If that made me terrible, I guess I deserved that title." After Abel retired, Lindsay and Howe played with a series of centres including Alex Delvecchio and Norm Ullman. Lindsay's efforts to form the players' association resulted in Detroit GM Jack Adams trading him to lowly Chicago before the 1957-58 season. After three seasons, he quit hockey and focused on his business interests in the automotive industry but he remained active, sometimes practising with the Wings and joined them for a final season, in 1964-65. In 2001, he founded the Ted Lindsay Foundation to fund academic research and autism programs. In 2014, the foundation pledged $1 million US to the Hands-On Parents Education Center in Royal Oak., Mich, which has been renamed The Ted Lindsay Foundation HOPE Center.